Barong is a lion-like creature and character in the mythology of Bali Indonesia. He is the king of the spirits, leader of the hosts of good, and enemy of Rangda, the demon queen and mother of all spirit guarders in the mythological traditions of Bali. The battle between Barong and Rangda is featured in the famous Barong dance to represent the eternal battle between good and evil (source:wikipedia). 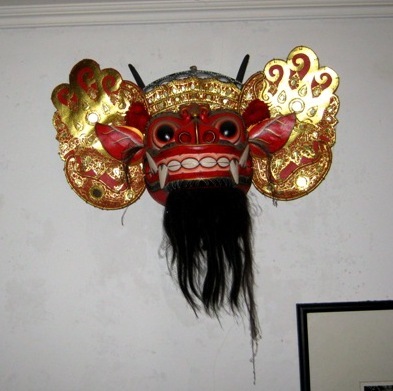 I share here a Barong mask that I saw on a restaurant's wall. Lots of red on the mask.